June, she’ll change her tune. In restless walks she’ll prowl the night. Any of the theories as to its meaning would work for me, but the snow on the ground, the shorter days, the layers of clothing I pile on every day or the space heater cranking away at my feet lead me to think about the seasons and how they change. I reflect upon the uncanny way each one has of representing a new phase or marking the visceral passage of time. 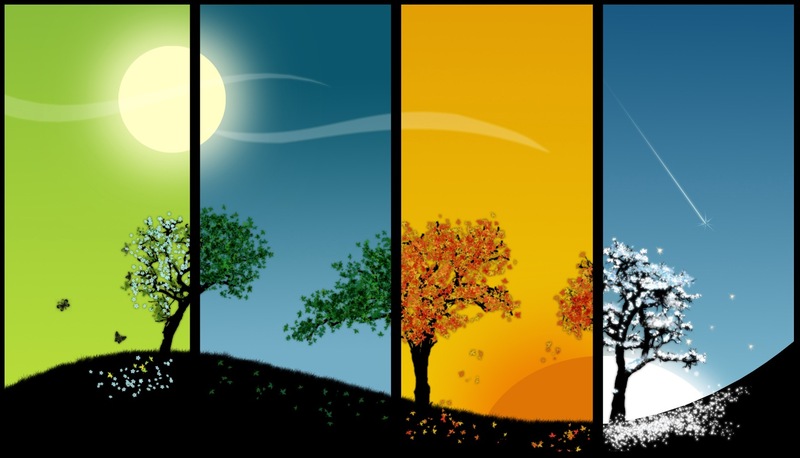 The inevitability of change… the promise of seasons is the only thing we can truly count on in this life. What is that saying? “The only constant is change?” … or something like that. The marching on of the seasons is reliable. No matter what is happening in our lives at any given moment — the backdrops of April, May, June, July, August, September and so on rarely change. April comes and thaws and fosters life with rain. May follows and we are so grateful to see her again. With her flowers and warmth we graciously hang on to every last drop of sun she offers. June finds us tiring in the heat with days that last so long they’ll draw us into the night before we ever even know it is upon us. July goes so fast with its high blue skies and holidays—like a month-long celebration—we’ll truly wonder where she’s gone by the time August interrupts. She gently reminds us that soon it will be time to go back. Back to school, back to work, back inside as the days grow shorter, darker… colder. September, we will remember, all the life and love and laughter that came with the start of April’s rain. Simply Beautiful – thanks for sharing a thinker of a post today:) I love the seasons and trying to be more open to embracing change in my life, since it has been a constant in my life lately. The birds are ga-ga in love right now – it is staying lighter out – the weather changes with a snap – transitioning from Winter to Spring. Have a Great One! What is it about the wintry months that make us muse about the seasons? Loved the verse. I wish that I had learned to handle change better because there has been far too much of it in my life and I do not handle it well. Excellent post, and I see the graphic designer in you with the choice of header for the post.